Sydney is my current AKC German Shepherd. She was born 9/2/2008, and is a very friendly, protective, active dog. Loves to go out in the country! One day she will run 25 miles and come back tired, wore out, wet, used up ... and the next day she is whining for more! Skipper, my beautiful old dog RIP 9/24/2004 at age 17. This page is a tribute to him. This picture Skipper at age 10. He is having the time of his life, having fun on the way to Glacial Lake! Go for it, Skipper. 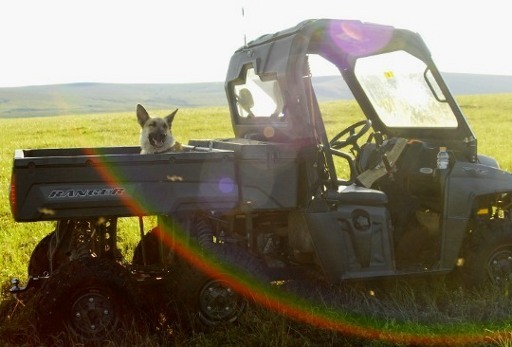 You've logged 8,000 miles along and behind the 4-wheelers since you turned 10 years old! 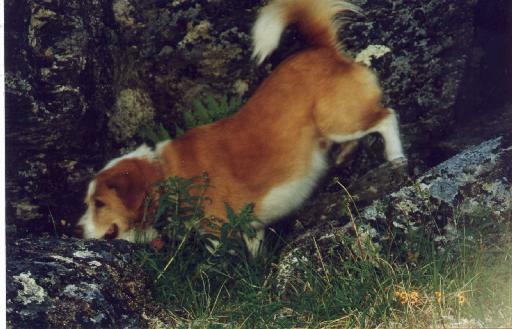 On the first snow of 2004, September 24, Skipper passed away due to complications of cardiac insuficiency. 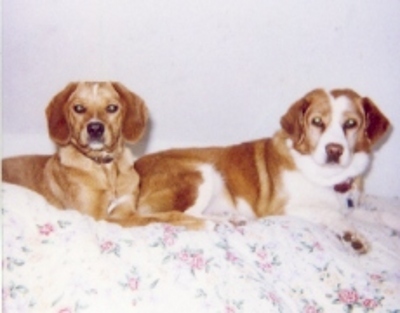 Here is a picture of the two dogs, Skipper and Lacey. Lacey is my daughter Nisi's dog, and was raised and trained to run by Skipper. Lacey also passed away in 2015 from cancer. She ran with my dogs whenever I could borrow her from my daughter. Beloved of Ramon and Nisi! May your spirit now roam the stars! 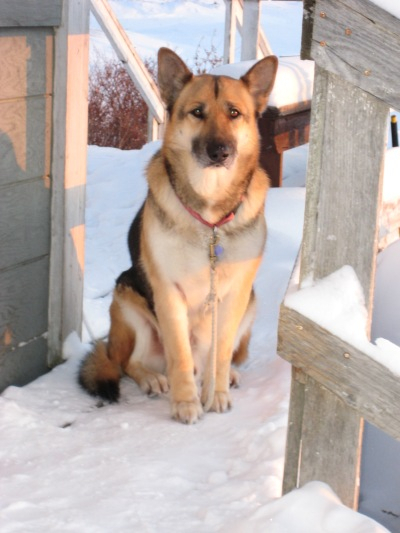 This is Strider, the 4 year old German Shepherd I adopted February, 2005. 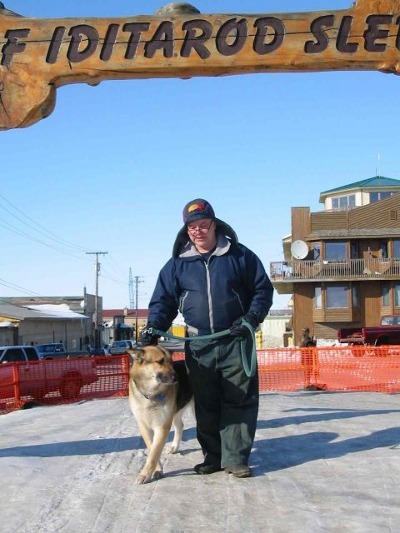 This picture was taken on 3/24/2005 under the Iditarod race arch. Strider is not a racing dog but I thought this would be a nice setting for the picture. He loves to ride in my Geo Tracker. He would sit up and just watch the scenery go by. 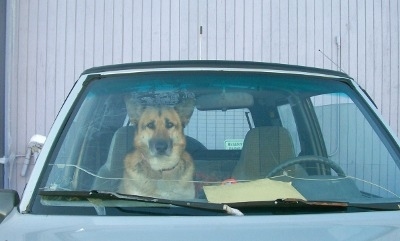 No need to lock the car with this fellow in there guarding it! July, 2007. This is a picture of Strider taken January 4, 2009. He is a very big, gentle dog. Harmless with other dogs and people, nevertheless he was a good hunter. He bagged numerous squirrels and even a raven. That raven was doing something in the willows, and could not fly off in time. Strider and niece Stacy were very close, and they often slept together on the couch, all intertwined. With great sadness I report that Strider crossed the rainbow bridge to the summerlands on December 12, 2009.